Exotic weapons are the best weapons in the game and that's a fact. Although you can mod any of the standard weapons to make them handle differently, Exotic weapons have Exotic mods which make them unique and deadly. 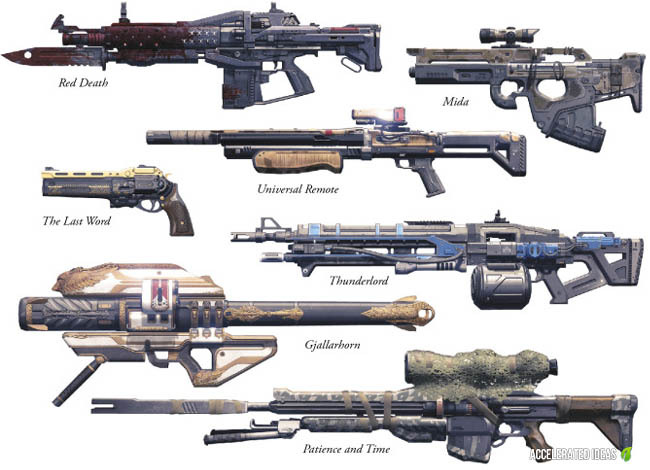 For example, Exotic Mods can change a basic Hand Cannon into a fully automatic version. Other Exotic Mods might change a sniper rifle so that you cloak while aiming. As you can see, it's for these reasons that Exotic weapons are the best and also the reason why Bungie limits their use. 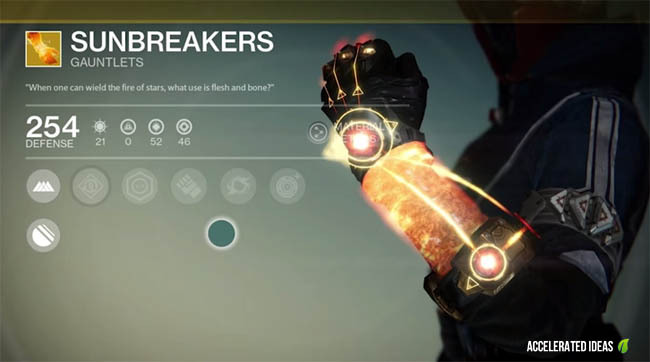 The Exotic class of equipment is rare and powerful and it's a level above that of Legendary. 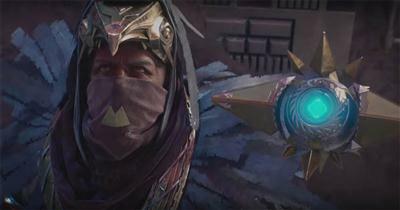 Exotic items offer unique effects and in particular some armour effects are specific to certain classes and specializations. To help balance the game, you're only allowed to equip one Exotic weapon and one Exotic armour at any time. As they say, you can bend the rules but you can't break them! Tip: Read about the Exotic Bounty - a guaranteed way to get an Exotic Weapon. The best exotic weapons are those which provide an epic bonus upgrade. These include the rocket launcher which fires cluster missiles upon round detonation and the sniper rifle which activates camouflage every time you aim down the sights. 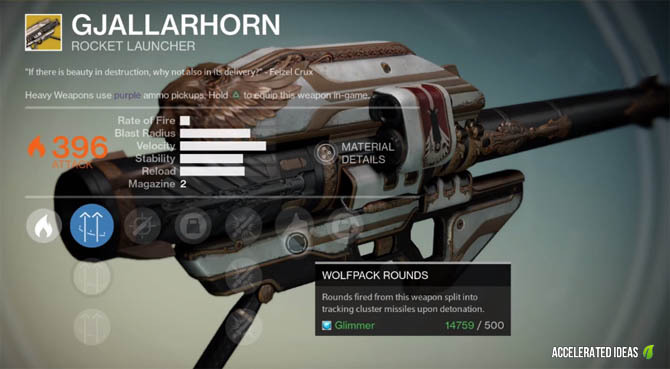 Gjallarhorn (rocket launcher) - The final upgrade for the Gjallarhorn will turn rounds into tracking cluster missiles upon detonation. Truth (rocket launcher) - final upgrade turns rounds into heat seeking missiles, automatically targeting enemies for you. Patience and time (sniper) - Gain active camoflague while aiming down the sights. Pocket Infinity (fusion rifle) - fires in full auto mode and you actually reclaim rounds that miss the intended target. 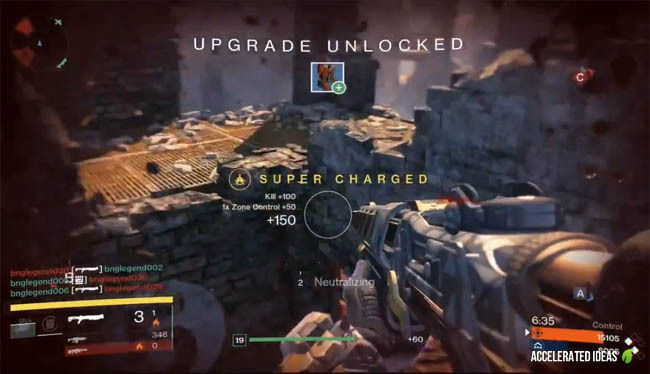 Suros Regime (auto rifle) - the final bonus for this weapon means that the bottom half of the ammo clip will deal bonus damage and actually restore health for success hits. How to get Exotic weapons? As you can see, they're not easy to find and certainly something for the later levels of the game and for higher ranked players.